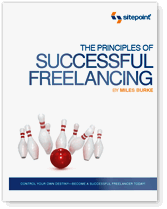 The Principles of Successful Freelancing is FREE for 10 days! Donâ€™t Twitter? Thatâ€™s cool, youâ€™re still covered. All you need is an email address and we’ll send you the download details posthaste (remember to check your spam folder). Already following @sitepointdotcom? You still get the freebie, just verify here, and we’ll provide you the download details. Want to Win a MacBook Pro as Well? The good folks at 99designs.com, the sponsor of this giveaway, happen to be running a Twitaway of their own. Follow @99designs on Twitter. Make sure you’re still around for the for the September 30th draw and you could win a shiny new MacBook Pro!Entering the draw couldn’t be simpler. Follow @99designs = a chance to win a MacBook Pro! Remember to Tell your Tweeps! As if everything above was not cool enough, the most creative tweet containing the #twitaway hashtag will win a super secret prize — but more on that next week. Weâ€™re able to provide this freebie thanks to the team at 99designs. If you have a minute, people, pop over and check them out as a way of saying thanks for the free book. Act Quickly, Or You Might Miss Out!